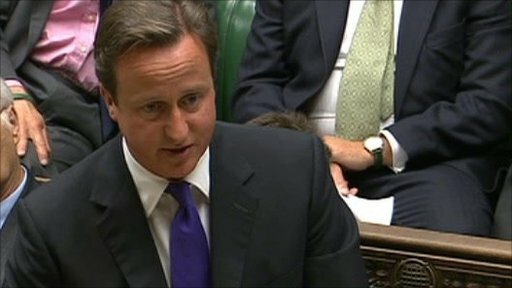 Prime Minister David Cameron has told MPs that the UK could be "proud" of its support for the uprising in Libya, declaring that the removal of Col Gaddafi from power was a "major achievement" by the Libyan people. In a Commons statement on 5 September 2011, he said: "It is the Libyan people who have liberated their country. "There was no foreign occupying army. This has been a Libyan-led process, assisted by the international community. "Many cynics proclaimed stalemate and asserted that Gaddafi would never be defeated. The Libyan people proved them wrong." Labour leader Ed Miliband also praised the "courage" of Libyans, commending the British government for its role in securing international action. "If we had not acted, we would have been spending recent months not talking about the progress of our action in Libya but wringing our hands over the slaughter in Benghazi, as we did after Bosnia," he said. Mr Cameron also told MPs that accusations that the British security services had become "too close" to their Libyan counterparts under the previous government would be fully investigated. Papers suggesting close ties between MI6, the CIA and the Gaddafi regime were found in Tripoli by staff from Human Rights Watch. An anti-Gaddafi military leader says he wants the UK and US to apologise for organising his 2004 transfer to Libya. Mr Cameron told the Commons the latest allegations were "significant" and would be examined "very carefully" by the inquiry led by Sir Peter Gibson, which was established to examine whether the government was involved in, or aware of, improper treatment of detainees abroad. The inquiry is due to start at the end of an ongoing police investigation, but campaigners and lawyers acting for former detainees have said they will boycott it, citing concerns about its transparency and credibility. Where could Gaddafi be hiding?